It is now commonplace to say that the canon wars of the 1980s and early 1990s provoked changes to anthologies in the following decades. What we read in the Norton, Blackwell, or Broadview anthologies of British or American literature is not what we read thirty years ago. The change has been characterized as a movement away from aesthetic criteria—Matthew Arnold’s famous “the best which has been thought and said in the world”—to a more representative selection, one that conveys the diverse literary landscape of a defined historical period or national tradition. In the 1990s, space opened for underrepresented authors, genres, historical moments, and worldviews; John Milton and William Wordsworth now mingle with Anne Finch and Olaudah Equiano, appearing alongside anonymous popular ballads, snippets of periodical essays, excerpts from novels, and a smattering of letters and speeches—varied content that projects an overall tilt toward diversity of matter, form, and authorial identity. Ours is not, however, the diversity promoted by the literary miscellany, that popular, eclectic, omnivorous genre so omnipresent in earlier periods. Twenty-first-century anthologies seek to represent a broad and varied spectrum of literary production, but they retain a defining feature of the anthology as it was consolidated at the end of the eighteenth century: organization by author in chronological sequence. Even with the addition of thematic sections, anthologized literature as we know it today remains fundamentally historical, and each selection implicitly functions as a representative specimen, an illustrative example standing in for a larger authorial corpus or class of work. The justification for a literary collection based on historical representativeness—the legitimating force behind modern anthologies of English, American, or Anglophone literature—emerged in Britain around 1800. It was spurred, as I will argue here, by dramatic changes in what we see as a distinct sphere of knowledge making—namely the collection, organization, naming, and representation of plants in the previous century. This claim is not as surprising as it may seem. Botanical metaphors for the poetic collection have a very long history. Rooted in the Στέφανος, or garland, of Meleagar of Gadara and the Silvae of Statius, for centuries verses have been gathered up into florilegia, anthologia, sylvae, gardens, garlands, woods, wreaths, bouquets, and anthologies, this last from the Greek ἀνθολόγιον, a gathering of flowers. In Britain, collections of vernacular poetry were ushered in with titles like England’s Parnassus; or, the choicest flowers of our modern poets (1600) and Belvedere; or, The Garden of the Muses (1600). Tropes of the bouquet, garden, and forest were regularly deployed throughout the seventeenth and eighteenth centuries to legitimate the heterogeneous content of verse and prose collections, but the field of nineteenth-century literary annuals was lush with these figures. This efflorescence of the botanical metaphor for collections was spurred by a vigorous debate about the purpose, audience, and content of poetic collections in the decades around 1800. At the turn of the nineteenth century, compilers took up botanical metaphors to argue whether a collection ought to strive for a historically representative selection or for a selection of acclaimed pieces “carelessly mingled with all the ease and wildness of natural variety.” For antiquarians like Henry Headley, George Ellis, and Robert Southey, compilation was a recovery project, a method of preserving worthy specimens of poetry from oblivion; for their contemporaries Vicesimus Knox, William Mavor, and Samuel Jackson Pratt, among many others, the ideal collection contained a great variety of the most influential, recognized, elegant work, poems of unquestioned merit that displayed the richness and vitality of the poet’s genius, an image of living nature. Carried out in the prefaces, title pages, tables of contents, and introductions to collections, this contentious debate predicted the agon of the canon wars. Scholars of late eighteenth- and early nineteenth-century poetic collections have noted the abundance of botanical metaphors, even occasionally employing them to structure their own arguments about literary compilations. Most studies of poetic collections in Britain before the twentieth century, however, focus on a set of issues common to miscellanies and anthologies: the economics of the publishing market, changes in copyright law, canon formation, expanding readerships, and editorial practice. Critics have frequently used literary anthologies to take the pulse of the eighteenth-century book trade: printed anthologies and miscellanies proliferated throughout the period, and the forms they took responded (at least in part) to ongoing legal disputes over publishers’ rights to valuable literary property, increases in literacy and access, and changing technologies of print. Scholars agree that the form and function of the anthology shifted in the decades around 1800, but they disagree about exactly when it occurred, how it was manifested, and what provoked this change. I won’t claim to fully resolve this conundrum, but I will insist that we need to look outside the narrow field of poetic or even literary collecting to understand the changing cultural role of anthologies and miscellanies—and even single-author collections of verse—in the Romantic period. Beyond Barbara Benedict’s acknowledgement that “it is no coincidence that the genre of the literary collection crystallized during the long eighteenth century when collecting itself became a popular activity” as a form of self-fashioning for the emergent middle class, existing studies take little notice of nonliterary collecting practices. As I will argue, Romantic-era collections of poetry were not just metaphorically but also materially conditioned by the projects of botanical collecting, preservation, classification, description, and illustration of the previous century. Editors legitimated their selection and organization of poems in collections by trading on the aesthetic paradigms and material practices of botanical science and art. Further, the evaluative principles structuring poetic collecting in the Romantic period emerged when editors drew on, separated, or combined competing strands of Enlightenment natural history, specifically Linnaean taxonomy and Buffonian vitalism. A pointed antagonism between taxonomic representativeness and an aesthetics of vital nature is thus central to my argument. The dominant theory of poetic collecting in late eighteenth-century Britain replicated a desire in visual and verbal art to represent the vitality of living nature, a trend spurred by transformations in botanical description and illustration. A confluence of factors changed botanical collecting and publishing in the eighteenth century, including shifts in the geographies of collecting; developments in conventions of botanical naming and systems of nomenclature; the emergence of vitalist theories in natural history; and the application of eighteenth-century aesthetic theories to scientific illustration. As a result of these shifts, living plants were collected, dried, and pressed in a hortus siccus (an herbarium or book of dried plants), becoming botanical specimens that were subsequently imbued with the semblance of life in drawings, paintings, and engravings. This process—what I call aesthetic reanimation—reveals how scientific and aesthetic paradigms merge to dismantle and remake objects of botanical knowledge in print. I trace the consolidation of reanimation as an aesthetic paradigm as it was formulated in William Hogarth’s Analysis of Beauty (1753) and applied to botanical illustration by a group of artists employed by Joseph Banks to illustrate the specimens collected on Capt. James Cook’s Endeavour voyage of 1768–71. I then detail how the reanimated plants of eighteenth-century botanical illustration enter the lexicon of Romantic poetry with Erasmus Darwin, grandfather of Charles Darwin and progenitor of an early theory of evolution. Embracing the animating power of prosopopoeia, E. Darwin translated the aesthetic principles of botanical illustration into his two-part allegorical poem, The Botanic Garden (part 1: Economy of Vegetation, 1791; part 2: Loves of the Plants, 1789). 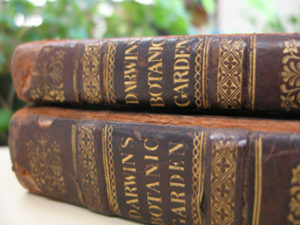 In this heavily annotated and illustrated poem, Darwin combines taxonomy with vitalism to promote a particular brand of poetic and aesthetic vitality, one that defined the “nature” of plants collected in his poetic-botanic garden. This essay argues that the modern literary anthology—and specifically its aspiration to delimit both aesthetic merit and historical representativeness—emerged as a response to changes in eighteenth-century botanical collecting, description, and illustration. A dramatic upsurge in botanical metaphors for poetic collections around 1800 was triggered by shifts in the geographies, aims, and representational practices of botany in the previous century. Yoking Linnaean taxonomy and Buffonian vitalism to Hogarth’s line of beauty, late eighteenth-century botanical illustrations imbued plucked, pressed specimens with a new vitality. Erasmus Darwin’s Botanic Garden (1789, 1791) translated the aesthetic reanimations of visual art into a collection of poetic specimens, spurring compilations that promote a vitalist standard of literary value. By rejecting aesthetic reanimation as the figurative ground for poetic collecting, Charlotte Smith and Robert Southey forward an alternative historical model of literary merit, one grounded in the succession and continuity of representative literary types. These competing metrics for selection and valuation underwrite the anthology as we know it today. DAHLIA PORTER has taught literature, book history, and the history of science at the University of Glasgow, University of North Texas, and Vanderbilt University. Her book Science, Form, and the Problem of Induction in British Romanticism is forthcoming with Cambridge University Press, and she is a member of the Multigraph Collective, a team of twenty-two scholars who have collaboratively written Interacting with Print: Elements of Reading in the Era of Print Saturation (University of Chicago Press, 2017). This entry was posted in Essays and tagged Anthologies, Botany, Darwin, Romantic, taxonomy by Reps Admin. Bookmark the permalink.